A friend of mine just had a beautiful, amazing, gorgeous baby boy. We got to meet him today and hold all 9 pounds of him. I'm used to swinging around all 26 pounds of my not-so-little boy and 9 pounds feels like holding a box of tissues! Tiny babies are amazing. Anyway - I took the mama these dense, chewy, peanut buttery, chocolaty granola bars so she has something to eat while wandering the house in the wee hours holding that beautiful, amazing, gorgeous, AWAKE baby! New mamas and papas NEED energy food. Makes 24 bars, or you know, one serving. To begin, grease the bottom of a 9x13 baking dish. Then lay a layer of parchment paper in the bottom so the edges hang out. 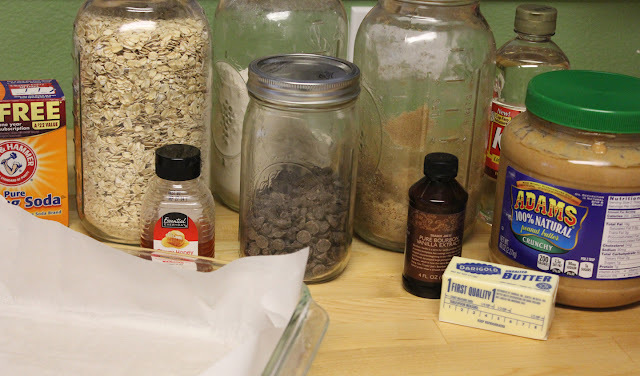 Grease the parchment paper. You're going to pull the bars out of the dish using these flaps so make sure you have enough to grab. 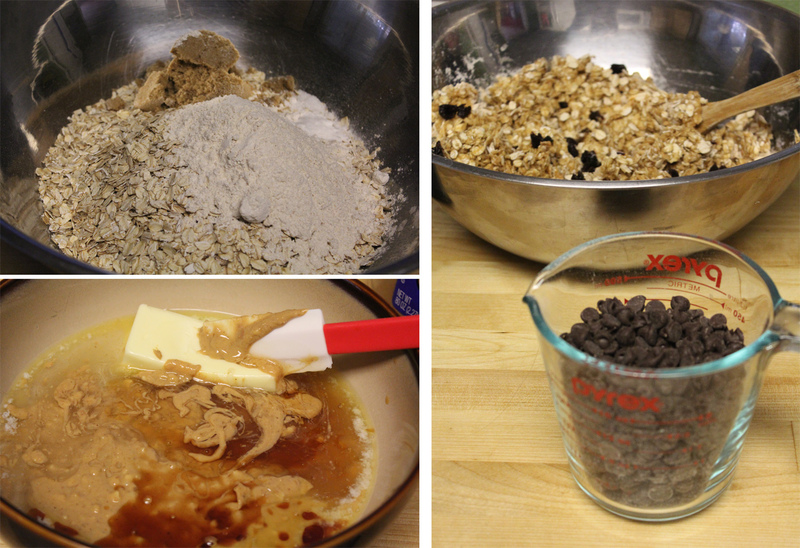 In a large bowl, mix together oats, flour, baking soda and salt. In another bowl, mix together softened butter, peanut butter, corn syrup, honey and vanilla. Bake 25 minutes or until the top is lightly browned. Let the granola bars cool completely before trying to cut them. As with brownies, I think it would be a good idea to refrigerate these before cutting to get a nice, clean edge. As you can see, I rushed things a bit and didn't let these cool enough before I cut them. Boooo!! I think shredded coconut would be a wonderful addition. Apricots and white chocolate would be amazing substitutes!! 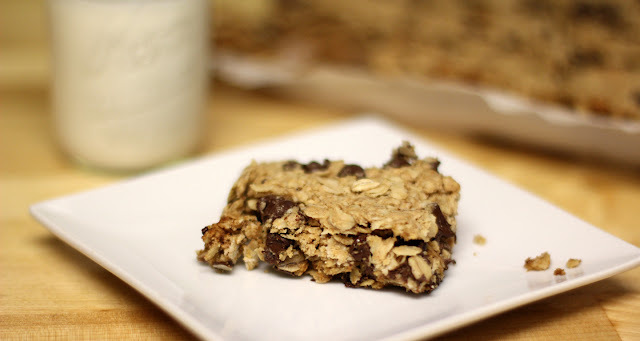 Rich and chewy and definitely good energy food. I'll be making a batch of these because I cant keep my kids away from yours! :) Thanks again!